A few months ago Liz from American Girl Fan had a competition with my How to Make Doll Clothes video course being the prize. Dakota was the lucky winner and was so excited about learning how to sew doll clothes that she took some photos of her first sewing project after doing my course. Dakota and her mom worked together to make the sports shorts! Her mom did the sewing and Dakota did the ironing. She really enjoyed spending time with her mom sewing together and when they were finished they were really thrilled with the result. It looked like something that would come out of a store! Dakota was so surprised to see how they turned out. They were using her great grandmother’s sewing machine and were worried that it wouldn’t sew properly and thought about hand sewing them, but when they were finished they were so glad they didn’t! Dakota said it was so nice sewing something for her dolls and she is looking forward to making more doll clothes using the free patterns that came with the course. She just had to share this photo of McKenna sporting her new shorts. A special thank you to Dakota and her mom for taking the time to send me these wonderful photos and telling me about their experience doing my course and using my patterns. It truly is awesome knowing that mom and daughter enjoyed their time together creating doll clothes and I helped to make it happen. I look forward to hearing from Dakota again when she makes her next outfit. Don’t forget the extra special Christmas bonus I have with my How to Make Doll Clothes video course. YOU get to choose an additional free doll clothes pattern when you purchase my course either online or on DVD – that’s 9 FREE doll clothes patterns but only until Christmas Eve! 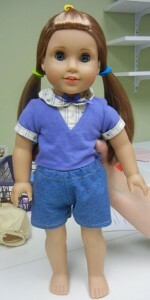 To find out more visit my How to Make Doll Clothes page. She is a natural. Very nice job ! Great job, Dakota. I think McKenna was smiling extra wide with her new shorts. 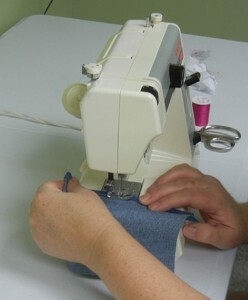 Keep up the good work and enjoy the world of sewing for your beautiful American Girl. What a great shared experience! Hope this will be a lifetime joy for Dakota! I’m 65 and still happily making doll clothes!!!! Very nice job to both mum and Dakota..I’m sure it was a lot of fun for both of them..looking forward to more news about their sewing journey.